Cathy Carl, co-owner of Sisterhood Scrapbooking & More, a locally owned stationary shop in the Midwest, has plenty of ideas when it comes to incorporating origami designs into cards and stationary. She and Brenda Clayton began their business after visiting another store in the area. 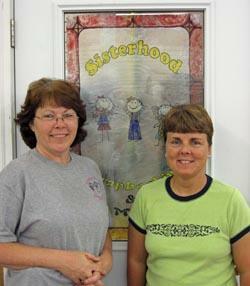 Sisterhood Scrapbooking & More offers workshops to teach others about paper crafts. Cathy Carl leads the origami workshops. She has agreed to share some of her insights with LoveToKnow Origami readers. 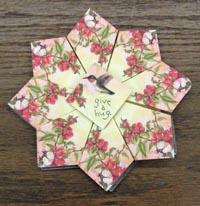 LoveToKnow (LTK): How did you first become interested in origami? 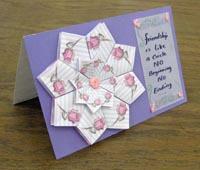 Cathy Carl (CC): I have always been interested in paper crafts, whether it be origami, card making or scrapbooking. I probably first became interested when my daughter made a box in school and showed me how to do it. I bought books that would show me how to make other objects. I am always excited to find other projects made out of paper. It just amazes me how a simple piece of paper can become something totally different. LTK: What are your favorite figures to fold and why? CC: I really love to do the tea bag folding. I know that is really not a specific figure, but I love to go to the store and find a designed piece of paper and tea bag fold it into a beautiful medallion. I also enjoy fold it in such a way that the design is folded using several pieces of paper but can be put together as the one design it started as. 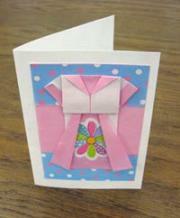 LTK: Why incorporate origami in card making? CC: It makes the cards 3D. They pop out at you; it just looks so cool! It's amazing how you can get one sheet of paper folded into a design you would recognize. LTK: Some origami enthusiasts feel that figures should be "pure" and only involve basic folds and one sheet of paper. 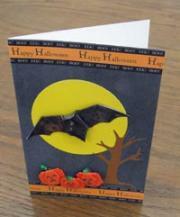 However, many designs involve cutting (kirigami), gluing, stapling or otherwise decorating the folded figure. What are your feelings on how to create origami? CC: To me, origami is a beautiful art form. Whether it is done in the "pure" form or uses several pieces of paper, if the end result is a beautiful folded piece of art, it really doesn't matter to me how it got there. Sometimes you cannot get the results that you want unless you use another medium or cutting, tearing or gluing. LTK: How do you come up with your ideas for origami figures? CC: Most of my origami figures are done using basic tea bag folding. If I am making a card or a scrapbook page and I need a figure, I can usually find the basic design that I need in a book, and follow that until I get the figure that I really want or need. I like to use shopping list paper for my tea bag folding designs. They make some really neat medallions and designs. LTK: You teach workshops on how to fold origami figures at your scrapbooking store. What advantages do classes and workshops offer for both novices and experts? CC: Not only do I teach the workshop, but I learn a lot from it, too. Someone always has a question that I try to answer with everyone in mind. I do the folds with the class; it's hands on for me, too. I think classes and workshops allow others to share their experiences and give others a chance to make something out of a basic piece of material that we tend to take for granted. A simple piece of paper can be turned into a flower, or an animal of choice, just by making a few folds. That can help build confidence to do other things that one may not have thought of before the class. It helps develop creativity. LTK: What tips do you have for people who are just starting to learn origami? Can you offer any pointers for people who have mastered the basics and want to move onto the next level of folding? CC: Keep practicing. The folds will get there-sometimes it is not as complicated as we make it. For those that want to move to the next level, just keep finding new figures to fold. Go to the library and find books on origami; learn those folds. Go on the Internet and find figures that you might like to learn. There are lots of free patterns and designs. Just keep learning and folding. Creativity is only limited by your ability to want to learn and do. If you want to learn it, you will. It is like I always tell my kids, "You can do anything that you put your heart and your mind to do," and I believe that. Carl, as previously mentioned, especially enjoys making figures and cards using tea bag folds. Tea bag folding originated with making origami out of actual tea bags or envelopes; now, it often refers to making more geometric shapes or medallions using small scraps of paper.